Glen I. Parker, ACMM, born May 28, 1916, Alden, IA. Education: 10 years plus 3 years agriculture college. Joined the USN Jan. 1, 1940, and was stationed in the USS West Virginia and NAS Ottumwa. Memorable experience was waking up alive on the USS Solace, Dec. 9, 1941. 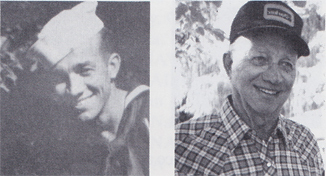 Parker was discharged Sept. 22, 1945. His medals and awards include the Good Conduct w/stars and WWII Pacific Theater Group Commendation Medal. Married Dorothy Hay dock (deceased) then Ila Chaloupek on Feb. 22, 1959. He has two sons, two daughters, two step-sons, one step-daughter and 18 grandchildren. Retired from Civil Service after 24 years and lives in Russellville, MO. He enjoys traveling and football games.